“While both writers are correct, organisations’ strategies should go beyond practical incentives and training” (Incentives Alone Not Enough To Nurture Volunteer Spirit, Eunice Amanda Wilbertine Nah). Volunteers like Miss Eunice Amanda Wilbertine Nah – who emphasise selflessness and a willingness to go the extra mile (TODAY, Jan. 23) – are hard to come by, and while voluntary welfare organisations and charities will, of course, prefer a steady stream of manpower with the right motivations and attitudes. 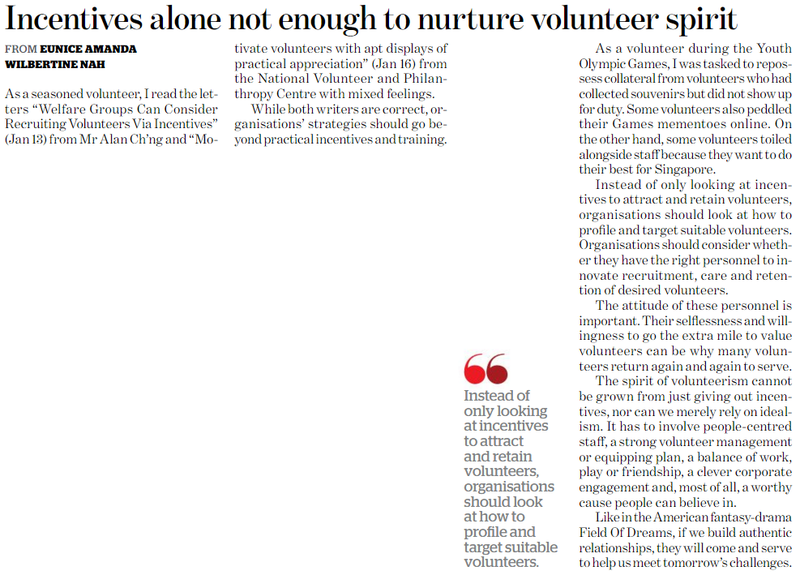 Yet these self-driven individuals are often the exception, and even with the best strategies these organisations will not necessarily recruit or retain volunteers in the long run. Juggling between work or school and demands of their personal lives, it may be hard for many to get started in the first place, let alone commit sustainably. But clever use of these incentives could encourage Singaporeans to have a go. In this vein, proposals to incentivise volunteerism may not be ludicrous. There may, however, be some caveats, perhaps in terms of how these incentives should not take the form of monetary transactions, and that the incentives should cease after a stipulated period. But clever use of these incentives could encourage Singaporeans – who may otherwise shun opportunities to volunteer in voluntary welfare organisations or charities, or who may not be cognisant of socio-economic challenges in the country – to have a go. I used to be critical of the pragmatism upon which the “Community Involvement Programme (CIP)” in schools (now “Values in Action”) was premised upon, and the exchange of service for CIP hours felt crude. Nonetheless the endeavour gave many students the chance to do their part, to do something in the community. Having volunteered in different capacities since 2006, it has also taken me time and plenty of reflection to understand personal motivations for my involvement, and to eventually settle for causes or undertakings which I care for. It is also true that “Organisations should consider whether they have the right personnel to innovate recruitment, care, and retention of desired volunteers”, though it should be noted that organisations in the sector often struggle with manpower and resources. Having some incentives in place, I believe, creates at least a critical base from which voluntary welfare organisations and charities can work from. It can, for instance, be ascertained whether CIP and service-learning in the schools have been useful for the organisations and their programmes. And if so, whether the arrangements can be customised to attract more families or adult volunteers. Thereafter, the engagement of these volunteers can then be contemplated.